I’m happy to announce that I’ll be working my first red carpet event next weekend! I couldn’t think of a better time to experience my first red carpet than during The Kentucky Derby festivities. 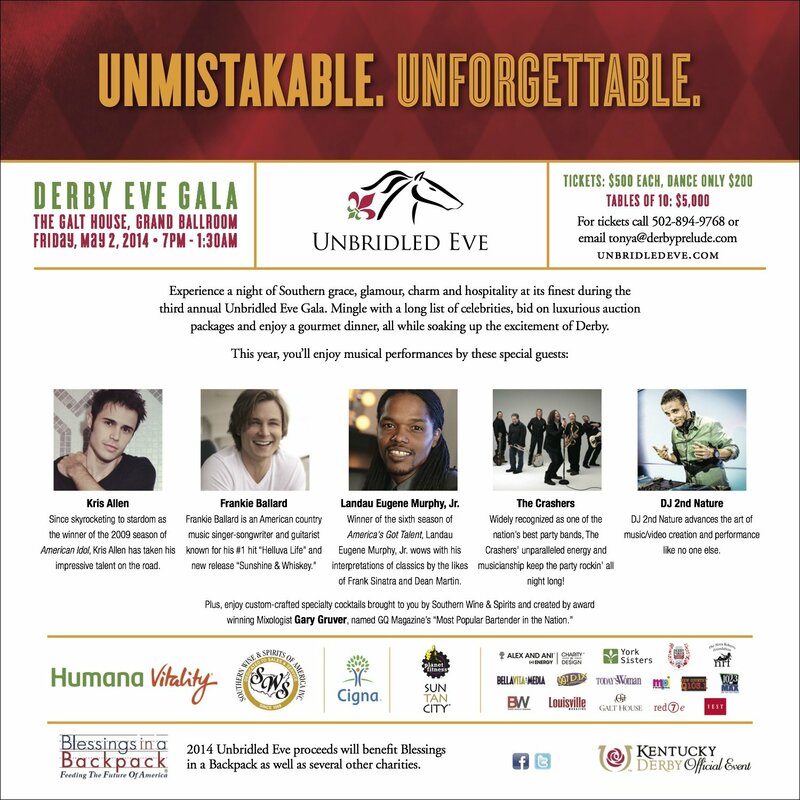 I’ll be interviewing/pretending to be a celebrity with the long list of local and national celebrities that will be attending the 3rd Annual Unbridled Eve Derby Gala at the Galt House Hotel. Tickets are still available for this night you’re sure to not want to miss! More information on that and the charities that benefit from this incredible night are below. Chart-topping country singer/songwriter Frankie Ballard (No. 1 country song “Helluva Life”) and American Idol: Season 8 winner, Kris Allen will headline the Third AnnualUnbridled Eve Gala, it was announced today by event co-founders and sisters, Tonya York Dees and Tammy York Day. The black tie-optional soiree will also feature performances by Landau Eugene Murphy, Jr.(winner of America’s Got Talent) and party dance band, The Louisville Crashers. CNN’s Robin Meade and Derby enthusiast and host, Nick Ferrara will emcee the event. Named an Official Kentucky Derby Event, the Third Annual Unbridled Eve Gala will take place in the beautifully renovated Grand Ballroom of The Galt House Hotel & Suites on Kentucky Derby Eve: Friday, May 2nd, 7 p.m. to 1:30 a.m. The exclusive star-studded gala, which draws local and national business leaders, horse racing industry professionals and celebrities from film, television, music, comedy and sports, provides the best in Southern hospitality and entertainment. “We are thrilled to be able to present the Third Annual Unbridled Eve Gala, an Official Kentucky Derby Event. We are so grateful to our sponsors, celebrity guestsand amazing volunteers who help us to raise awareness and make it possible for us give to so many worthwhile charities and organizations,” stated Hosts and sisters, Tonya York Dees and Tammy York Day. Past celebrity attendees and performers include Luke Bryan, Nicolas David, Lauren Conrad, Jane Seymour, Kate Flannery, Lance Bass, Jennifer Tilly, Geoff Stults, Randy Owen, Dennis Haysbert, Greg Grunberg, William Fichtner, Bob Guiney, Warren Moon, Ice-T and Coco, and more. In addition to the celebrities and live musical performances, guests will have the opportunity to bid on fabulous items from the live and silent auctions including some of the most luxurious wining, dining and getaway packages in the world, while enjoying ten spectacular Southern Wine & Spirits specialty bars serving craft cocktails made by the very best mixologists and bartenders in the area, including Belvedere, Sidney Frank, Four Roses, Constellation, Diageo Captain, Campari, Jim Beam, and a special Champagne bar. For the third year in a row, the primary beneficiary of the Unbridled Eve Gala is Blessings in a Backpack, a 501 C (3) non-profit organization that currently feeds nearly 65,000 children in 680 schools in 45 states. The unique program feeds a child in the program for an entire year for only $100, providing support for elementary school children whose families qualify for the Federal Free and Reduced Price Meal program and who have minimal food on weekends. The program’s success has been measured in better test scores, improved reading skills, positive behavior, improved health and increased school attendance. Another NEW beneficiary is “Stand Up For Gus,” an organization founded by actor Jason Patric, who will be one of Unbridled’s celeb guests this year. Additional beneficiaries include the Les Turner ALS Foundation, Winter HAYven (founded by Lori Dougherty whose horse, Ride On Curlin with jockey Calvin Borel, will race in The Kentucky Derby on May 3rd), and Kentucky State Police/Trooper Island Inc., Operation Homefrontand Neighborhood House. The Unbridled Eve Gala is also proud to partner with Phil Hellmuth, Denny Crum and Robert Williamson III on the Derby Poker Celebrity Bourbon Bash (www.derbypokerchampionship.com) the Official VIP Welcome party for Unbridled Eve, held on Thursday May 1, 2014. The top level “Champion” sponsors of the third annual Unbridled Eve gala are Southern Wine & Spirits and Humana Vitality. Other sponsors include Cigna, Sun Tan City, Planet Fitness, The Nora Roberts Foundation, Red7e, Vest Advertising, The Galt House Hotel & Suites, Derby Deals, Alex and Ani, Barry Wooley Designs, Yum! Brands Foundation, Millennium, Visual Productions and Bella Vita Media. To purchase tickets, visit our website,www.unbridledeve.com and click on “purchase ticket” or call 502-894-9768 or email[email protected]. Tickets are $500 and an after 10pm “dance only” option is available.